The following article should acquaint the less experienced surgeon with the author`s technique of the closure of a cleft palate. It is striking that the Interplast teams during their surgical camps and outreaches are confronted to an unequally higher number of patients with cleft lips than with cleft palates. Furthermore in countries or regions where cleft surgery is performed by local surgeons who are not very experienced with cleft surgery, it is often encountered that the cleft lip is timely closed during infancy without closure of the cleft palate later on. Different reasons for this are conceivable: the parents might regard the reconstruction of the lip as sufficient and do not show up again for further reconstruction of the still clefted and open palate. Or the surgeon with limited experience in this field of plastic surgery might fear the complexity of the procedure and consider the possible risks of palate surgery with severe postoperative bleeding, wound dehiscence and obstruction of the airway as too high and therefore avoids this operation. However from a medical point of view the anatomical and functional reconstruction of the hard and soft palate is indicated in any case. The creation of a natural border between oral cavity and the sinuses prevents the contamination of the sinuses and of the lacrimal ducts with food and therefore reduces the infection rate. It also improves the ventilation of the middle ear via the Eustachian tube, alleviates the food intake, corrects a hypernasality and provides a stronger voice. The stigma of an open palate varies according to the culture, the socio-economical class and the private and work environment. But it is also dependent from the sound characteristics of the patient`s native language. The extend of the psychological strain of an untreated cleft palate is evident, when patients themselves attempt to close the palate or a fistula of the palate in a provisory fashion. During surgical camps the author has seen many materials, that were placed into palatal clefts or in residual palatal openings by patients. Besides denture like obturators other auxiliary material such as wool, wax, leaves or chewing gum are being used and can be retrieved from the cleft cavity. The goal of an surgical procedure on the hard and soft palate is the complete closure of the cleft with nasal and oral mucosal flaps from the tip of the uvula to the incisive papilla. In addition the muscles of the soft palate which in cleft patients have a false insertion on the posterior border of the palate have to be released (fig. 1), rotated to the midline and fused with their counterparts from the other side, as a third layer (anatomically in a horizontal direction called “intravelar veloplasty” according to Kriens). This facilitates a full mobility of the reconstructed soft palate and a complete nasopharyngeal occlusion. In patients who did not have received any previous surgery this can be achieved in most cases with the existing local tissue. In the closure of large residual palatal perforations or in wide open clefts sometimes pedicled flaps of neighbouring tissue have to be used such as the buccal mucosa, the Bichat’s fat pad or mucosal-muscle flaps from the pharyngeal walls or mucosa from the back of the tongue. In our camps and outreaches a double layered closure of the nasal and oral mucosal sheets should be the goal. In the literature single layered closure procedures of the hard palate with a cranially based vomer flap or a single laterally pedicled mucosal flap are mentioned. These single layered methods provide under the circumstances and conditions provided by our hospitals at home (postoperative feeding with a nasogastric tube followed by liquid food, optimal oral hygiene, short term follow up etc.) very good results and reduce the flattening of the palate arch and the growth inhibition of the maxilla induced by an elevation of the periost. Because of the suboptimal conditions during camp surgery and the sometimes non existing health care and hygiene inside the patients` homes, the double layered closure of the hard palate is a significantly saver choice. 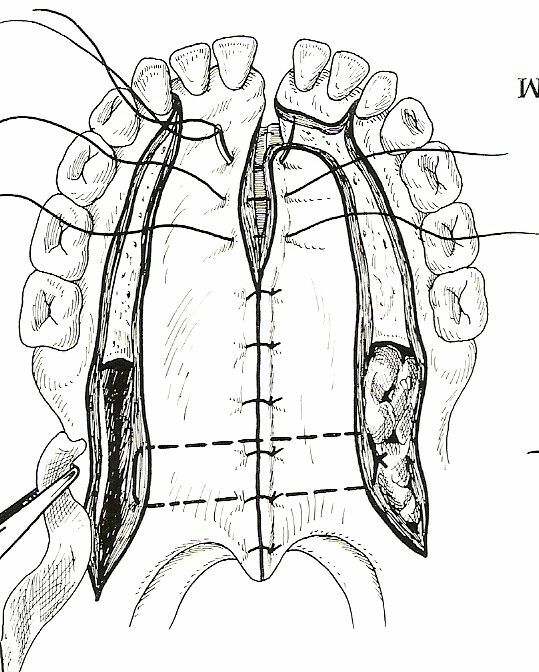 The method of a double layered closure can be traced back to Langenbeck (in the 1850s) and has been modified by Veau, Ernst and Axhausen to that extend that even very wide clefts can safely be closed under the conditions we are provided with today (intubation ventilation, micro instruments, atraumatic suture material). 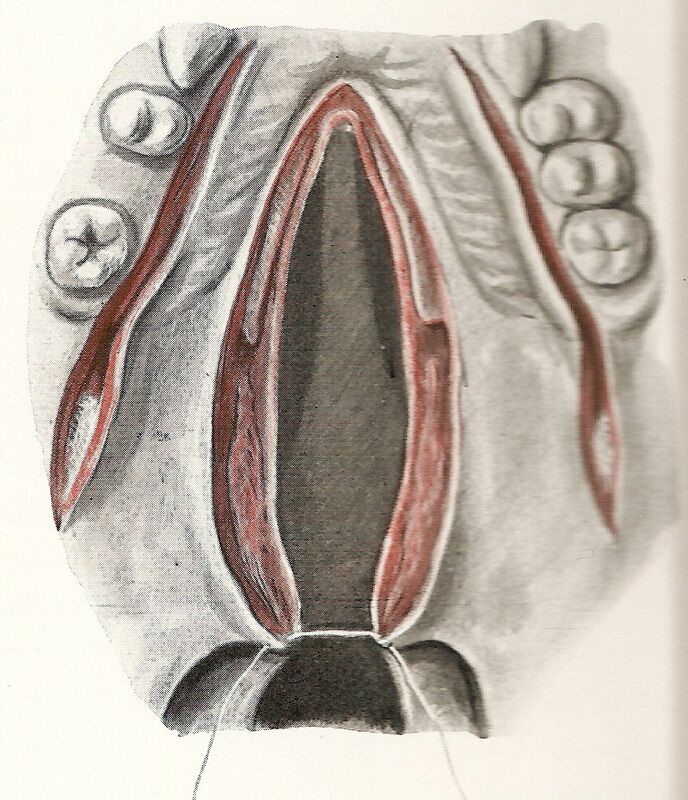 The drawings in Axhausens textbook of surgical techniques from 1936 (Technique and Results in Palate Plasties, Georg Axhausen, Georg Thieme Verlag 1936) is an aid for the beginner in cleft surgery which can hardly be improved. 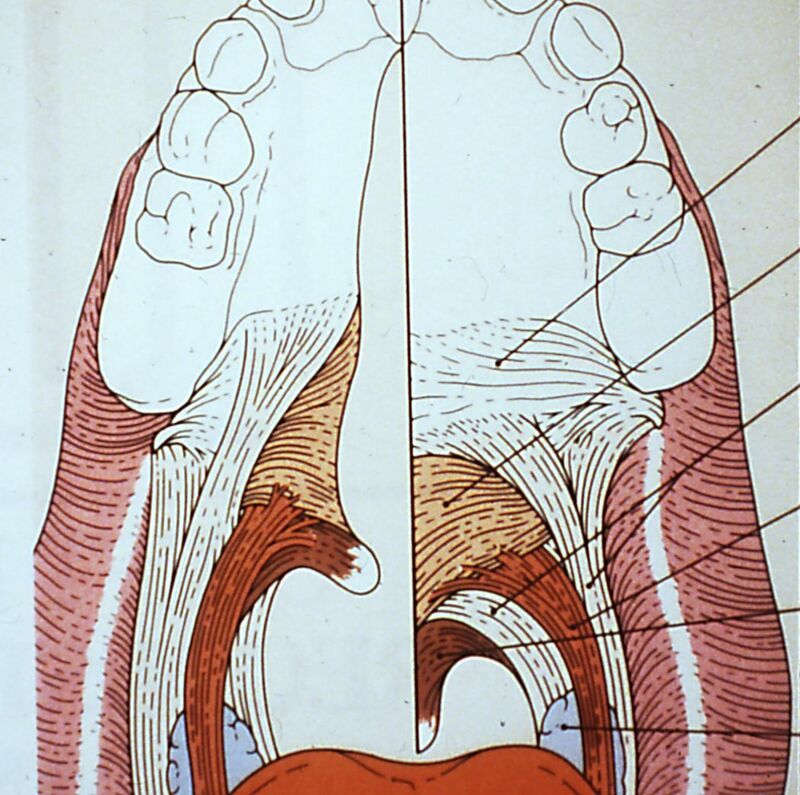 The 1965 described method of relieving and mobilizing the muscle from the palate, in particular the levator veli palatini muscle, should be part of any cleft palate closure today. Internationally the technique according to Furlow, with two reverse Z-plasties of the oral and nasal mucosal and muscle sheets are gaining more and more importance. This technique however requires a high grade of experience in cleft surgery and therefore is only of interest to a few surgeons during Interplast camps. 1. 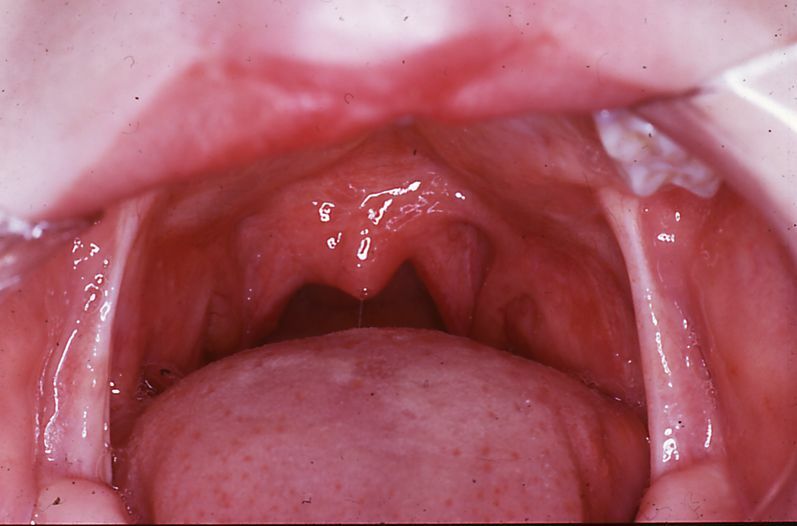 The in the 8th week of gestation insufficient merging of the palatine process, from the tip of the uvula in variable extension, maximally reaching up to the papilla incisiva, produces isolated soft- and hard palate clefts. 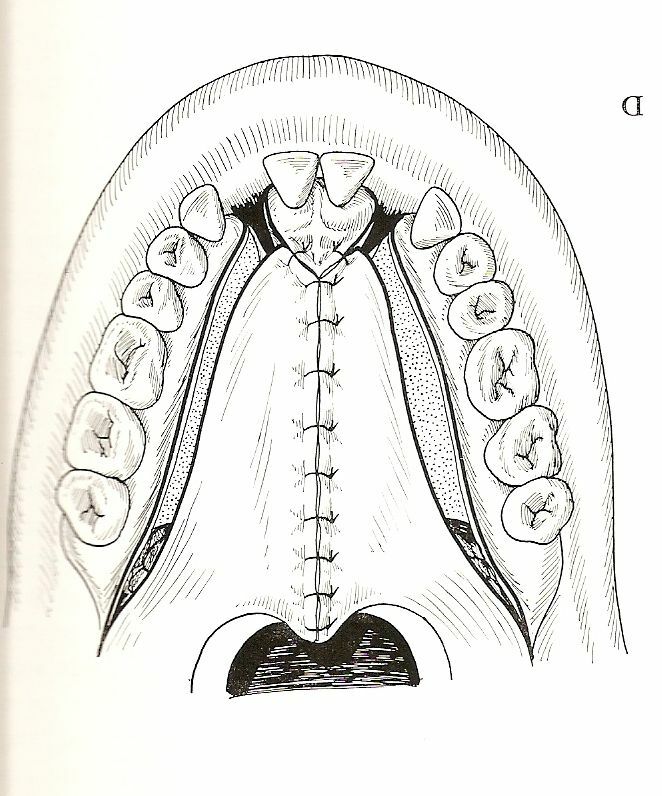 In this type of clefts the caudal end of the vomer is lying free in midline the cleft (fig. 2 and 3). 2. This type is formed in the 6th gestational week. The combined unilateral cleft lips and palates are always splitting the uvula starting ventrally from the lip and running through the alveolar process and the nasal floor into the hard- and soft palate. 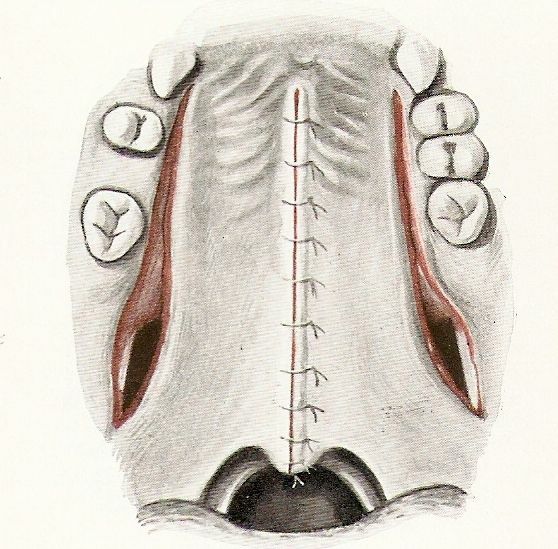 The caudal end of the vomer is always connected to the non splitted side of the palate (fig. 4). 3. This is the bilateral type of cleft-lip and palate and is also formed in the 6th week of pregnancy. The hard and the soft palate is completely splitted. Hereby the caudal end of the vomer is lying freely in the cleft (fig. 5). 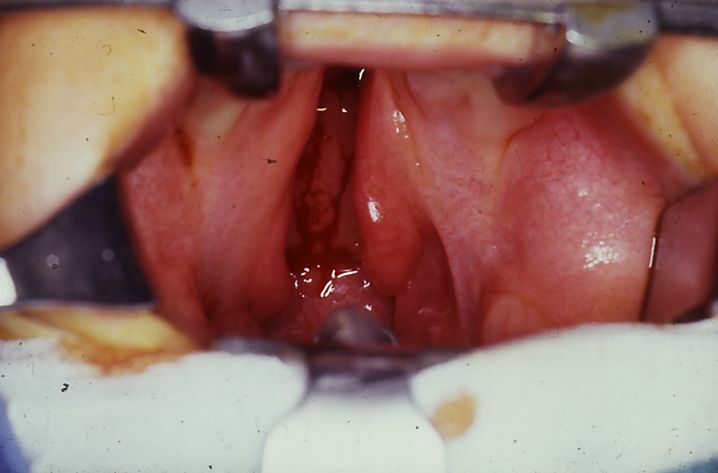 The surgical techniques only differ so far in that way that in case of a exposed caudal end of the vomer, the mobilized nasal mucosal flaps from both sides of the palatal shelves are joined with the detached mucosa of the both sides of the vomer to build two separate nasal ducts. The choice of the cleft surgeon is to elevate a dorsally monopedicled or a dorsally and anteriorly bipedicled flap of the oral mucoperiosteum layer. If the oral respectively the palatine mucosal periost flap is formed as a ventrally and dorsally bipedicled bridge flap (fig. 6) or as a considerably more mobile, dorsally monopedicled flap (fig. 7), is determined by the possibility to archieve a safe double layered cleft closure ventral in the area of the intermaxillary bone. 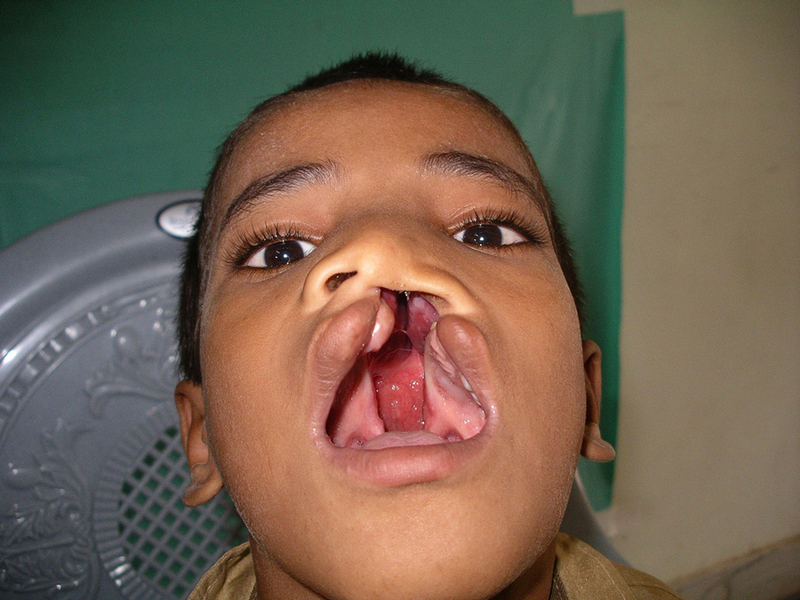 In case of a complete cleft lip and palate the use of a monopedicled flap would be favoured in order to gain a safe closure in the ventral part of the cleft. The vitality of both types of flaps seems to be identical. The monopedicle flap facilitates a preparation of the palatine major artery and the muscles of the soft palate on the dorsal margin of the hard palate. However the fixation of this flap in the area of the frontal teeth can be difficult (cave: wound dehiscence and ventral detachment of the flap.). With its natural ventral tissue bridge the monopedicled bridge flap however is always safely attached. The author favours the bridge flap, whenever possible. A combination, on one side a bridge flap and on the other side a monopedicled flap is also possible (fig.8). A transsection of the major palatine artery should be avoided. However the author up to date never encountered a postoperative flap necrosis due to incidentally cut palatine artery in course of the mobilisation. In literature it is pointed out that a transsection of the artery leads to a growth inhibition of the jaw, however the dissection was still seen as a necessity by von Axhausen 1936 and Gelbke 1964). Should a lesion of the artery occur an accurate cauterization is crucial. If this is impossible due to a retraction of the artery into its bony canal then the bleeding should be treated by firm packing of the canal with Tabotamp (oxidised Cellulose) or a similar firm material. Postoperative bleeding can mainly be traced back to the pterygoid plexus or the palatine artery (as below). Local anaesthetics with adrenalin are to be used with caution as they can produce a surgical field without bleeding even though the artery has been cut. As suture material the author always uses at home and during camps 4×0 Vicryl with a RB1 needle (Ethicon). Alternatively, in very young patients and in narrow cleft spaces 5×0 Vicryl with a JTF needle is used. Oral intubation with a Woodbridge tube. The positioning of the patient should be on his back with a maximum reclination of the head in Trendelenburg position (head below the surface of the table in 45degrees) if this is possible. In addition rolled up towels are positioned between the shoulders. Disinfection of the face and the oral orifice with a mucosal disinfecting agent such as aqueous iodine solution. Insertion of a Dingman mouth gag. The tongue should be in mid position. A tongue spatula has to retrieve the tongue safely out of the operation site. Injection of Ultracain DS forte solution (Articainhydrochlorid + Epinephrine) alongside the medial cleft edge from the uvula up to the ventral end of the cleft underneath the palatinal mucosa, into the muscle of the soft palate and dorsal of the tuber maxillae under aspiration. Grab the tip of the uvula with a forceps and cut towards the posterior nasal spine (if necessary palpate the spine before and mark it). Cut along the border of the oral-nasal mucosa and the mucosal sheet only (fig. 9.). 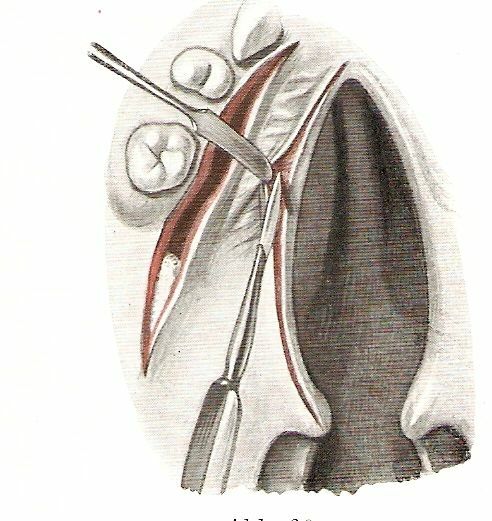 Close to the posterior nasal spine the incision is shifted slightly towards the palate in direction onto the oral mucosa. By this way a 1mm wide strip of oral mucosa remains median to the incision line on the cleft border pedicled to the nasal mucosa. 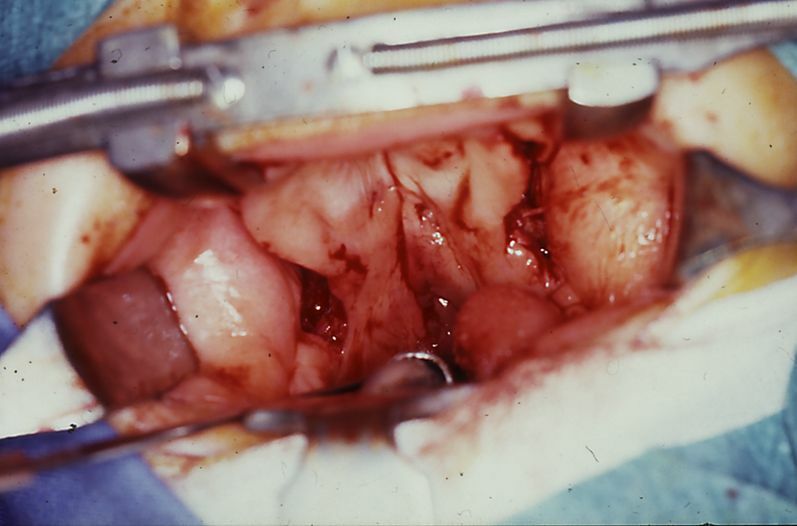 Later on this strip of mucosa is folded cranially along the rim and used to hold the sutures. Patients with isolated cleft palates should be treated with bridge flaps only. 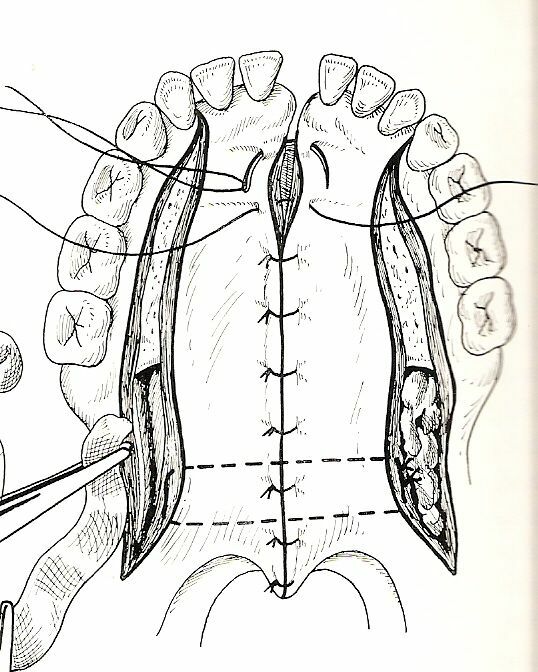 In this case the incision is extended ventrally to the anterior end of the cleft into the midline and converges there with the incision of the opposite site. In the cleft lip and palate patient the incision is continued into the cleft of the alveolus, by maintaining the 1mm distance from the border between the oral and the nasal mucosa. If the cleft lip had been closed prior to the closure of the palate, as it will be in most cases, the anterior end of the incision is up to the dorsal end of the reconstructed nasal floor. Should the lip have to be closed during the same setting, the incision runs all along the palate shelves and through the clefted alveolus bilaterally along the transition line of oral and nasal mucosa up into the surgical field of the cleft lip. This incision line ends up into the mucosal incision for the lip reconstruction, so that the mobilized nasal mucosal sheet can form the nasal floor and the oral mucosal sheet covers the alveolar process. The second incision for the construction of the palatine monopedicled or bipedicled flaps starts dorsal of the tuber maxillae and crosses the plica pterygomandibularis in a dorsolateral to ventromedial direction. It is crucial that this incision runs out in a lateral direction towards the cheek. A more sagittal direction of the incision in extension of the row of the teeth bears the risk of an uncontrolled tearing of the mucosa into the glossopalatine arch during the following preparation. Now the mucosa around the tuber maxillae is incised circularly with continuous contact of the blade onto the bone. On the palatine side of the teeth row that incision proceeds anteriorly by leaving a margin of 2mm gingiva along the teeth, or in case of toothless infants 3-4 mm of mucosa on the palatine side of the alveolar ridge. Beware of the position of the tooth buds. 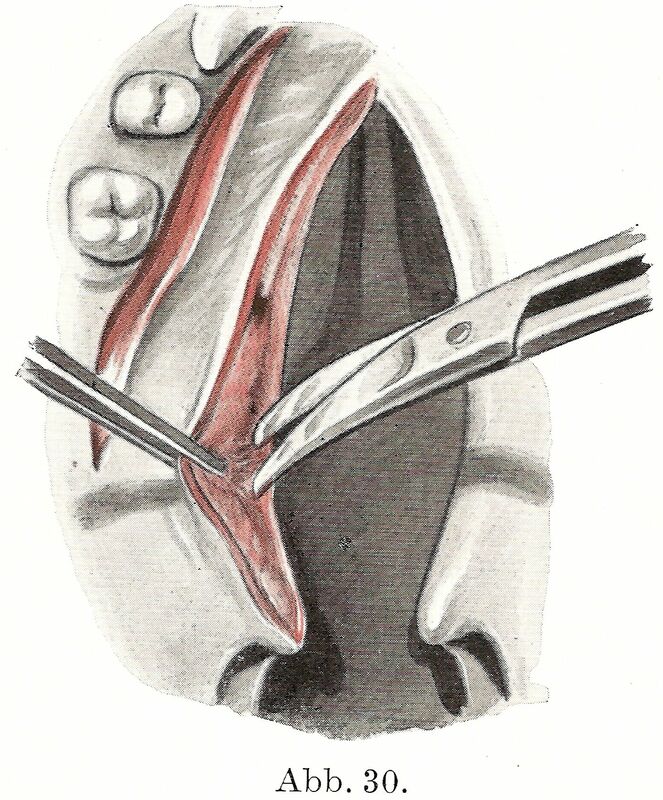 For a bipedicled flap (bridge flap) the incision stops in the area of the canine teeth. For a monopedicled flap the incision proceeds behind the front teeth forward until it resumes the incision running along the cleft margin somewhere in the area of the clefted alveolar process. Now the just circumcised complete oral mucoperiostal flap is separated from the bone with a fine and sharp periosteum elevator according to Freer/Yasergil or to Partsch following the incision lines. Along the cleft rim we start from the alveolar cleft backwards until we reach the posterior nasal spine by separating the nasal and the oral mucosa very carefully from the underlying palatal bone(fig. 9a). Subsequently the palatal mucosa is completely elevated with the same instrument (under constant contact to bone) from the lateral releasing incision along the row of teeth until one reaches by tunnelling to the previously prepared medial incision line. If the elevation of the flap is started from the front, the pedicle flap can be traced on its backside dorsally to the exit point of the major palatine artery. By pushing the connective tissue that surrounds the palatinal foramen aside and by slightly levering the vessel it can be easily dislocated several millimetres out of its canal. Sometimes the vessel is surrounded by a ring of very strong connective tissue. This tissue has to be incised carefully to further mobilize the artery and the flap. As expected the exposition of the vessel is considerably more difficult with a bridge flap than with monopedicled flap. As a rule in the deciduous dentition the vessel exits at the level of the second molar, in the adult dentition at level between the first to second molar. The flap is further mobilized by elevating the periosteum around the tuber maxillae. By incising the superficial insertions of the tendon of the pterygoid muscle a little bit with scissors, the flap can be distinctively easier mobilized medially. If the dissection around the maxillary tuberosity has been proceeded too far to the lateral side, parts of Bichat’s fat pad will protrude. This eventually hinders the further preparation, but does not influence the outcome of the operation. If desired, the fat pad can be intentionally mobilized by the end of the procedure to fill part of the lateral pockets and the exposed underlying bone, which are showing up there after the fusion of the flaps in the midline. By using a small bent periosteum elevator the hamulus of the pterygoid process and the posterior edge of the hard palate is now detected dorsally of the major palatine artery. All the inserting muscles in this area are detached from the bone while the hamulus is left behind and is not fractured. In addition the tissues lateral to the hamulus are split transversally by bluntly pushing a scissor in cranial direction to form the so called parapharyngeal pouch. By using blunt dissection the following muscles are progressively pushed medially: levator veli palatini muscle, tensor veli palatini muscle, palatopharyngeus muscle and the palatoglossus muscle. Ideally the mobilized side of the soft palate can now be shifted free of tension across the midline to the opposite side. This is the crucial moment for a wound closure free of tension. If a venous bleeding from the pterygoid plexus occurs the parapharyngeal pouch is packed with wet gauze, which is left behind and carefully removed until the closure of the palate is completed. If the bleeding persists this can packing can be replaced with a haemostyptic agent such as Tabotamp (oxidised Cellulose). Now we turn towards the median cleft rim. The nasal mucosa has to be mobilized until close to the posterior nasal spine. 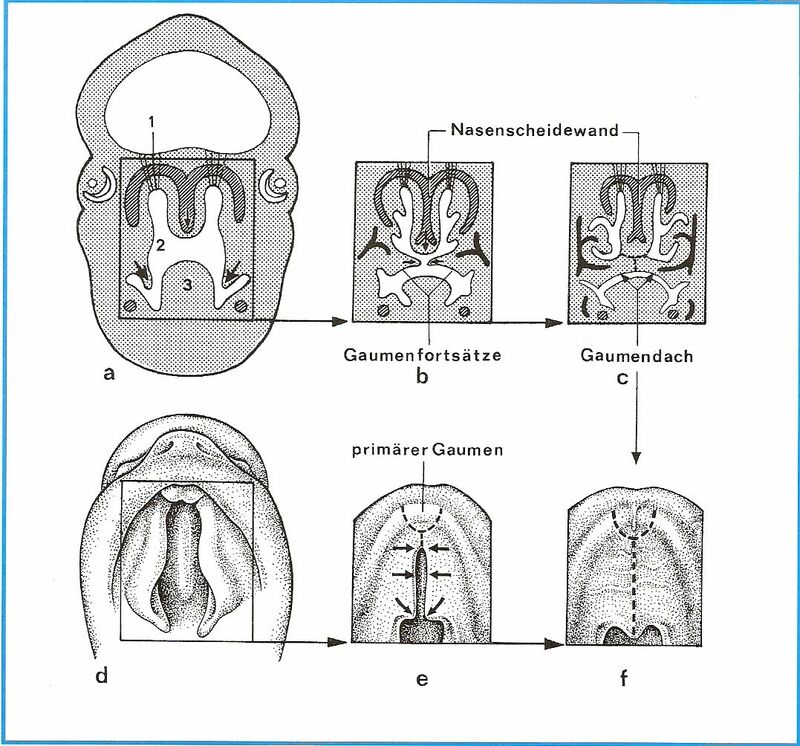 Beginning in the middle of the hard palate the mucoperiosteum is dissected from the vomer and the nasal floor with a fine periosteum elevator in ventral-dorsal direction (fig. 9a). Perforations of the paper thin nasal mucosa are to be avoided. Otherwise only a single layered palate closure can be achieved in these areas. Particular attention should be paid to area around the posterior nasal spine as there are very firm connective tissue adhesions. Finally the nasal mucosa can be mobilized free of tension over the midline in the sense of a reverse flap. Starting from the nasal spine all remaining muscle fibres inserting on the posterior edge of the hard palate have to be dissected free and positioned in a horizontal direction (fig. 10). Now at the soft palate the incision between the nasal and oral mucosal sheet is deepened by using sharp scissors to expose the velar muscles. Thereby it is attempted to dissect the muscle bundle in 2-3 mm depth as a third layer from the nasal and buccal mucosa. The older the patient the easier this step is, because there is much more muscle that can be dissected out. In infants and small children this has to be done very cautiously to avoid coming up restrictions of movements of the soft palate due to intramuscular scaring. After one side of the soft palate has been dissected into three layers, the opposite site is dissected identically. 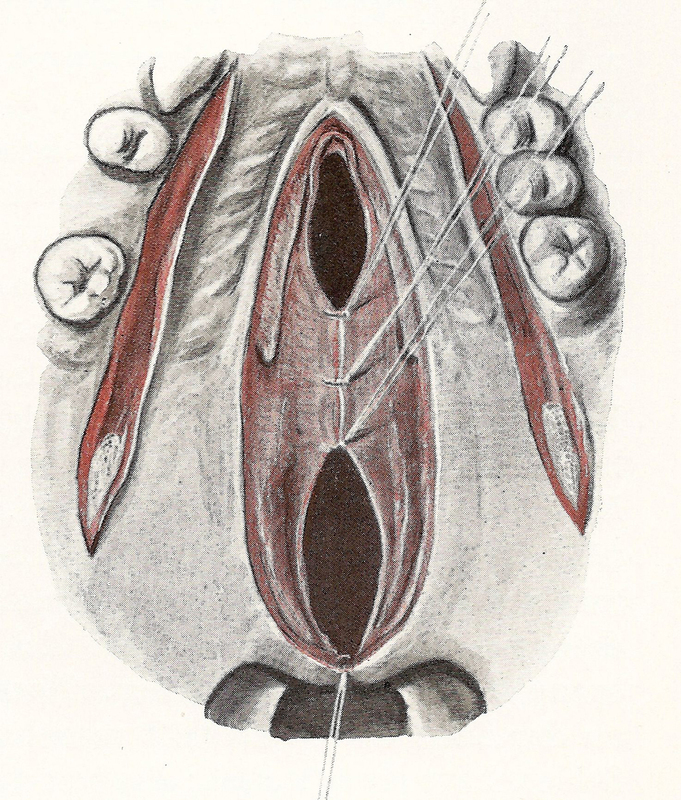 The wound closure begins at the tip of the uvula with a single knot (fig. 11). 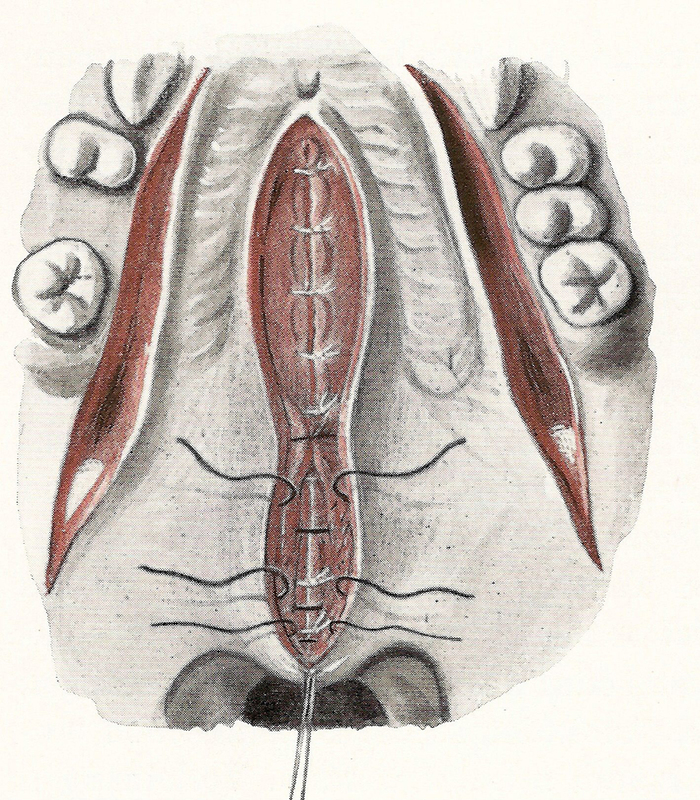 An exact union of both sides of the uvula is rarely possible due to its very soft tissue. After tying the knot, the needle bearing part of the thread is pierced through the middle of the back wall of the pharynx and tied off with the other end of the uvula suture. This suture pulls the uvula centred onto the posterior pharyngeal wall and stretches the nasal mucosal sheets of both sides, so that they fall together. This manoeuvre makes the wound closure a lot easier and avoids a mismatching the wound edges. Beginning at the uvula and progressing ventrally the nasal mucosa is now being closed with single stitch sutures everted into the nose (fig. 12). If the vomer is standing separately in the midline, an incision is made on its base over the entire length. Starting from here mucoperiosteum flaps are being mobilized on both sides of the vomer cranially and are joined with the before mobilized matching nasal mucosal sheets form the palatal shelves. 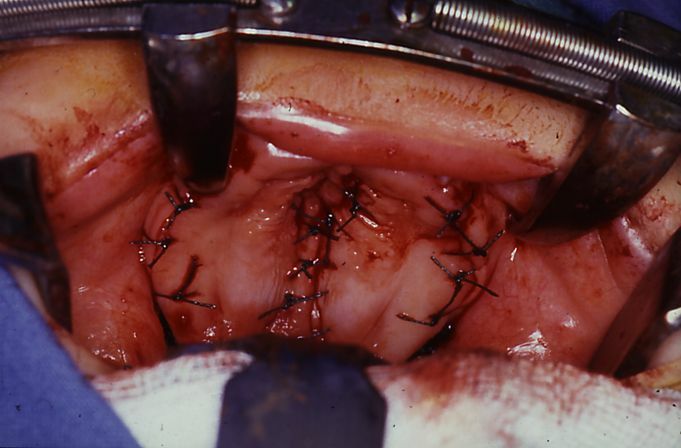 In this case the single row of sutures of the nasal mucosa along the soft palate has to divide into a double row of sutures at the level of the posterior nasal spine. On the division point a small defect remains in the nasal mucosa, which is later on closed by the joined muscle layer, respectively covered by the oral mucosal layer. Now the soft palate muscles are being completely released of the posterior edge of the hard palate (if it had not been done before) and slightly released from the oral and nasal mucosal sheet. As mentioned before, do not release more than 3mm in depth. The muscle layer is then shifted in a hoizontal direction and joined in the midline with the contra lateral side with deep biting single stitches(so called „intravelar veloplasty according to Otto Kriens“) (fig. 13). Subsequently the oral mucosal sheets are united by single stitch sutures. In areas of maximum tension (at the level of the posterior nasal spine) single vertical backstitches can additionally be applied. 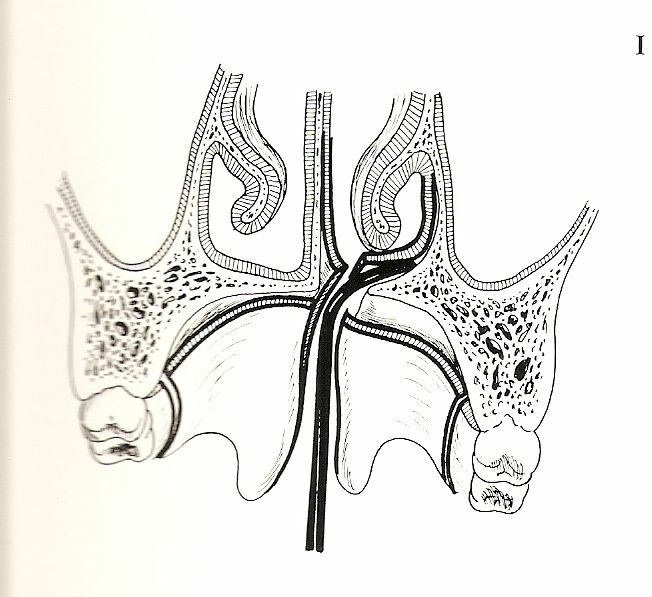 However horizontal backstitches are obsolete in the area of the palate as they cause a shortening of the velum and increase the risk of an insufficient nasopharyngeal closure(fig. 14). That would lead to hypernasality of the voice. During the closure of the mucosa of the hard palate two to three of the stitches should grab the previously closed nasal mucosa. By doing this the formation of dead space between the oral and the nasal mucosa can be avoided. This maneuvre also forms a high palate arch allowing the tongue to move freely. After closing the oral mucosa anterior and lateral fixation sutures have to be placed in case of a monopedicled flap. In case of a bridge flap only lateral fixation sutures are sufficient. These sutures guarantee the stability of the flap, therefore a pulling out or a cut through of these sutures has to be prevented at any cost. This can be achieved by so called peridental sutures. Thereby the gingiva is pierced distally to a tooth from the vestibular side, the needle is brought through the papilla of the interdental space and picked up on the palatinal side. There the needle is pierced through the lateral free edge of the palatinal flap as a mattress suture. The needle is then brought back through the next interdental space and exits on the buccal side of the tooth. This suture is tied along the gingiva or over the surface of the lateral side of the tooth. It proofs to be a very safe anchor of the flap even if oral feeding starts early. Two of these peridental sutures in the front and two per side are sufficient. In the sutures in midline of the palate should not be put under tension with these lateral fixing sutures, as this would increase the risk of a postoperative wound dehiscence. Therefore it is not unusual for large lateral mucosal defects to remain, however these defects always lie above bone. These defects close in general fast by free granulation and spontaneous epithelialisation. The wounds are comparable to wounds after a tooth extraction, which closes within a few days. By the end of the procedure the packings which have eventually been applied into the parapharyngeal pouches are removed or eventually replaced by haemostyptic agents such as Tabotamp (oxidised Cellulose). If it is bleeding below the palatinal flaps, lacerations of the major palatine artery have to be excluded, as these bleedings have to be dealt with immediately. To apply more and more packing won’t solve the problem and do not stop the haemorrhage. Instead these inserted materials prevent the adhesion of the flap onto the underlying bone. If the lateral soft tissue gaps appear too large (“rob Peter to pay Paul”), parts of Bichat’s fat pad can be mobilized from the cheek dorsally to the tuber maxillae and transposed into the defect as a pedicled flap. This flap of fat tissue is fixed to the mucosa with single stitch sutures. The surface of the fatty tissue is lying free in the oral cavity. It will soon be covered with an unsightly fibrin layer but will be fully reepithelialised after about two weeks. After suction of the nose and the throat and instillation of decongesting nasal drops, the mouth gag is removed and the patient is extubated. The author favours a single shot of antibiotics given during the operation followed by a 5days postoperative oral course with Amoxycillin or Clindamycin. Corticosteroids are given during the operation to prevent a swelling induced airway obstruction. The patients are allowed to take clear fluids on the day of the operation (no milk on the day of surgery) followed by 3 days of fluids and subsequent 3 weeks of soft diet. The oral cavity should be rinsed with water or a mouth wash frequently, starting on the day after surgery. The patient should avoid blowing his nose for 3 weeks to prevent a rupture of the sutures. Once a sufficient food intake can be documented the patient can be discharged to home. That will be around day 2 to day 3 after surgery. Images of the procedure can be found in fig. 15-18. As an early closure of the clefted palate improves the development of speech and hearing, due to an improved ventilation of the Eustachian tubes, the time of surgery has been brought forward continuously. The favoured patient`s age to close the palate in my hospital is between 9 and 12 months of age, in individual cases already at the age of 6 months. However the surgeon is confronted with a totally different situation during the camps. Normally during patients` screening no information about the health status of the patients is available. The children are often malnourished. Lab values, EKG and ultrasound are not existing and can not be provided. It is well known that patients with cleft lips and palates often have and patients with isolated cleft palates even more often have associated malformations of the circulatory system. Or the cleft palate can occur as a part of a complex syndrome. In very young children these problems often do not manifest in daily live but only during increased physical activity. Therefore an operation before the age of two years is seldom indicated during camp surgery. Exceptions of this rule can only be made by a well trained and established team of surgeons und anesthesists and with an adequate medical indication such as disturbed food intake. In Europe we commonly use custommade palate obturator plates in newborns, which make the intake of food a lot easier, keeps the tongue out of the cleft and influences the position of the clefted alveolus. The first impression of the upper jaw is taken during the first days of the child`s live and the plate is constructed individually. These plates are not available during surgical camps. The plates are individually formed with the help of a plaster of Paris model of the upper jaw and require constant follow up and potential adjustment or even production of a new plate according to the jaw development and growth. Otherwise these plates would lead to pressure points and necrosis of the mucosa or even of the bone. After the surgical closure of the cleft palate the plate is not needed anymore. At the end of the surgical procedure some surgeons favour to apply a dressing plate that covers the suture lines and presses the flaps onto both shelves of the hard palate. That is made out of an autopolymerising dental resin and left in situ for a couple of days after the operation. A less elaborate method is to place simple gauze packing below the palate fixed with tranversal stitches or wires to the teeth. That can be left in situ for up to two weeks. This cover should protect the wound from contamination and should press the oral and nasal mucosa together. However the food residues and wound discharges which can be found under this dressing once it is removed bring doubt on this concept. The author does not use packings or protecting plates on his patients as a principle. Long scalpel with a No 15 blade. I dedicate this article to my mentor, colleague and friend Prof. Dr. Dr. Wolfgang Steinhilber, Berlin, who deceased in 2009. I am very thankful to Dr. Cordula Tilkorn, (Christchurch, New Zealand) and Dr. Ruben Cohen (New York, USA) for the translation of that article into English language.